*Please do not use this method of communication to contact us about urgent or serious medical concerns. Please call 911 or contact our office at (952) 252 -6552 to speak with a nurse. 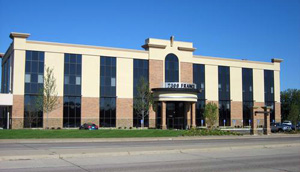 Our office is located near Southdale Mall, on the southwest corner of France Avenue South and Gallagher Drive in Edina, 1/2 mile north of I-494 and 1 mile south of Hwy 62. Free parking is available in our lot, which is accessible from Gallagher Drive. Please park in the front of the building on the France Avenue side. Take I-35W south. Exit on Hwy 62 west. Take the France Ave/CR-17 exit. Turn left onto France Avenue. Turn right onto Gallagher Drive. The first left will bring you into our parking lot. Take I-35W south. Exit on I-494 west. Take the France Ave/CR-17 exit. Turn right on France Avenue. Turn left on Gallagher Drive. The first left will bring you into our parking lot. Take I-35W north toward Minneapolis. Take the I-494 west exit. Take France Avenue/CR-17 exit. Turn right onto France Avenue. Turn left on Gallagher Drive. The first left will bring you into our parking lot. Take I-494 west. Take the France Ave/CR-17 exit. Turn right onto France Avenue. Turn left onto Gallagher Drive. The first left will bring you into our parking lot. Directions from the west:Take the I-494 east/MN-5 exit toward St. Paul. Merge onto I-494 east. Take the France Avenue/CR-17 exit. Turn left onto France Avenue. Take a left onto Gallagher Drive. The first left will bring you into our parking lot.